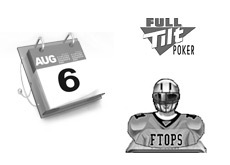 The ninth installment of the FTOPS (Full Tilt Online Poker Series) will get underway on August 6th. There will be a total of $15 million dollars in guaranteed prize money, and the usual assortment of "red" Full Tilt pros will be hosting the 25 different events. FTOPX IX kicks off with a $200 + $16 No Limit Hold'em event that will feature a guaranteed prize pool of $1 million dollars on August 6th. The event will be hosted by Allen Cunningham. Over the next 12 days, there will be a wide assortment of different events, ranging from a $2500 NLHE tournament that will take place over two days to a $500 + $35 No Limit Hold'em Heads-Up event, which will be hosted by Kenny Tran. The last day of FTOPS IX will be August 17th. On this day, you will have the conclusion of the $2500 + $120 two-day NLHE event, which will be hosted by Patrik Antonius. You will also have the $120 + $9 NLHE Knockout event, and the $500 + $35 NLHE Main Event, which will have a guaranteed prize pool of $2.5 million dollars. "cheesemonster" is the current reigning FTOPS Main Event champion, having taken down the event a few months ago for $410k.